Please join us for our Annual Meeting: Friday, May 10, 7:00 PM, 10 Governors Avenue. The annual meeting is a time to celebrate the accomplishments and elect the Board of Governors. All members of the community who enjoy history, especially Medford History, are invited to attend; only MHSM members are permitted to vote on the slate of elected Board positions. Refreshments and conversation follow. We encourage you to attend and consider becoming a MHSM member. 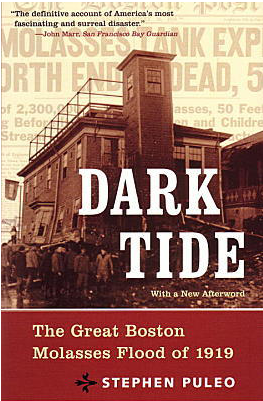 Discover the gripping story of the explosion of a 50-foot steel tank in Boston’s North End waterfront neighborhood on January 15, 1919. Containing 2.3 million gallons of molasses, the tank explosion destroyed everything in its path. Learn about the loss of lives, bodily injuries and destruction of property as well as the lawsuit that would lay the foundation for workplace safety. Presented by: Medford Historical Society & Museum, Medford Public Library, Royall House and Slave Quarters, West Medford Community Center, and the Medford Arts Council. Strolling through the Hallowells’ Neighborhood on Lower Mystic Street will be a visit to the domestic world of these families. Their stories reveal an array of independent thinkers who loved their children, neighbors and pets. Nicknamed “the Colony,” these households infused creative energy into the Medford community. Music from the Heart: Rediscovering the ‘Calhoun Plantation Songs’ presents spirituals compiled by Emily Hallowell, Edward’s daughter, when she taught in Alabama’s Calhoun Colored School in the 1890s. A live performance will recreate these sacred folk songs after Dee Morris highlights Emily’s life-changing adventure. Learn how Lydia Maria Child, a Medford-born daughter of a baker, became one of the most important writers and activists in nineteenth-century America. Special focus is given to her portraits and personal items. Medford Historical Society & Museum, 10 Governors Avenue. 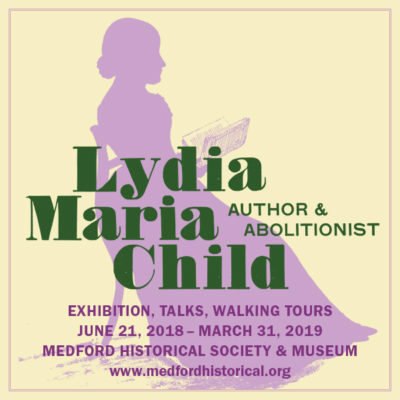 Lydia Maria Child: Author & Abolitionist are funded in part by a grant from the Medford Arts Council, a local commission that is supported by the Massachusetts Cultural Council and the City of Medford. Lydia Maria Child: Author & Abolitionist is also funded by the Tufts Neighborhood Service Fund. Celebrate the rich architectural history of Medford with an attractive historical marker that shows the original date your house was built. More Information.